Glock and Talo have partnered up together to bring you this exclusive Glock pistols that come standard with AmeriGlo Fiber Optic Sights. 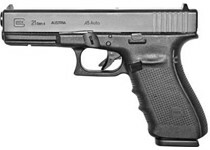 The GLOCK 23 combines compact dimensions for both open and concealed carry, with minimum weight, despite its large magazine capacity in .40 caliber. Having survived durability tests and use by U.S. Law Enforcement agencies, the G23 pistol has repeatedly demonstrated its world-class durability and reliability in even the most unfavorable conditions. That's why countless police authorities continue to adopt the GLOCK 23 as their official service pistol.